Identification: The silver carp is a deep-bodied fish that is laterally compressed. They are a very silvery in color when young and when they get older they fade from a greenish color on the back to silver on the belly. They have very tiny scales on their body but the head and the opercles are scaleless. They have a large mouth without any teeth in the jaw, but they have pharyngeal teeth. Its eyes are situated far forward on the midline of the body and are slightly turned down. Silver carp are unlikely to be confused with native cyprinids due to size and unusual position of the eye. They are most similar to bighead carp (H. nobilis) but have a smaller head, and upturned mouth without teeth, a keel that extends forward past pelvic fin base, lack the dark blotches characteristic of bighead carp and have highly branched gill rakers. The species is known for leaping out of the water when startled (e.g., by noises such as a boat motor). Distinguishing characteristics were given in Berg (1949). Keys that include this species and photographs or illustrations are provided in several of the more recently published state and regional fish books (e.g., Robison and Buchanan 1988; Etnier and Starnes 1993; Pflieger 1997). Size: 1 m and 27 kg. Native Range: Several major Pacific drainages in eastern Asia from the Amur River of far eastern Russia south through much of eastern half of China to Pearl River, possibly including northern Vietnam (Berg 1949; Li and Fang 1990). Table 1. States with nonindigenous occurrences, the earliest and latest observations in each state, and the tally and names of HUCs with observations†. Names and dates are hyperlinked to their relevant specimen records. The list of references for all nonindigenous occurrences of Hypophthalmichthys molitrix are found here. Ecology: Silver carp are primarily a species of large rivers. They can tolerate salinities up to 12 ppt and low dissolved oxygen (3mg/L). Silver carp feed on both phytoplankton and zooplankton (Radke and Kahl 2002). In their native range, silver carp reach maturity at between 4 and 8 years old but are noted in North America to mature as early as just 2 years old. They can live to 20 years. Spawning occurs at temperatures greater than 18oC. A mature female can lay up to 5 million eggs per year. Eggs require current to stay suspended, with a minimum length of spawning river estimated at 100km and a current speed of 70cm/s. Means of Introduction: This species was imported and stocked for phytoplankton control in eutrophic water bodies and also apparently as a food fish. It was first brought into the United States in 1973 when a private fish farmer imported silver carp into Arkansas (Freeze and Henderson 1982). By the mid 1970s the silver carp was being raised at six state, federal, and private facilities, and by the late 1970s it had been stocked in several municipal sewage lagoons (Robison and Buchanan 1988). By 1980 the species was discovered in natural waters, probably a result of escapes from fish hatcheries and other types of aquaculture facilities (Freeze and Henderson 1982). The occurrence of silver carp in the Ouachita River of the Red River system in Louisiana was likely the result of an escape from an aquaculture facility upstream in Arkansas (Freeze and Henderson 1982). The Florida introduction was probably a result of stock contamination, a silver carp having been inadvertently released with a stock of grass carp being used for aquatic plant control (Middlemas 1994). In a similar case, the species was apparently introduced accidentally to an Arizona lake as part of an intentional, albeit illegal, stock of diploid grass carp (W. Silvey, personal communication). Pearson and Krumholz (1984) suggested that individuals taken from the Ohio River may have come from plantings in local ponds or entered the Ohio River from populations originally introduced in Arkansas. Status: Records are available for 12 states. It is apparently established in Louisiana (Douglas et al. 1996) and is possibly established in Illinois; silver carp have been reported in Alabama, Arizona, Arkansas, Colorado, Florida, Indiana, Kansas, Kentucky, Missouri, and Tennessee. Douglas et al. (1996) collected more than 1600 larvae of this genus from a backwater outlet of the Black River in Louisiana in 1994. Burr et al. (1996) found young-of-the-year in a ditch near Horseshoe Lake and reported this as the first evidence of successful spawning of silver carp in Illinois waters and the United States. They felt that the species would be `established' in the state within the next ten years. Based on the occurrence of juvenile fish in Illinois waters, Pflieger (1997) felt that successful spawning of silver carp in Missouri seems inevitable. In the early 1980s commercial fishermen in Arkansas had caught 166 silver carp from seven different sites; however, during an intensive 1980-1981 survey to determine the distribution and status of bighead and silver carp in state open waters, Arkansas Game and Fish Commission personnel were unsuccessful in procuring any additional specimens (Freeze and Henderson 1982). Although Arkansas state personnel did not find young-of-the-year fish, several specimens taken by the commercial fishermen were sexually mature and exhibited secondary sexual characteristics (Freeze and Henderson 1982). Nevertheless, Robison and Buchanan (1988) reported that there was still no evidence of natural reproduction in Arkansas waters. Rinne (1995) listed silver carp as introduced to Arizona in 1972 and denoted it as established. Apparently in reference to the same record, William Silvey of the Arizona Game and Fish Department recently informed us that the only silver carp documented in Arizona open waters was a population inhabiting an urban lake in Chandler during the early 1970s. However, further investigation has shown that it was most likely a bighead x grass carp hybrid population (P. Marsh, pers.comm.). That population, along with a large population of diploid grass carp, was exterminated in 1975 or 1976 by personnel from the Arizona Game and Fish Department and Arizona State University (W. Silvey, personal communication). Pearson and Krumholz (1984) documented records from the Ohio River, but they did not include it as one of the species that exist in well-established, reproducing populations. Etnier and Starnes (1993) provided information on silver carp, but by publication they were unaware of any records of the species in the state of Tennessee. Although silver carp has not been physically detected in the Great Lakes, environmental DNA (eDNA) has been found in water samples collected in several areas in 2012: above electric barriers from Lake Calumet, the Little Calumet River, the North Shore Channel, and the Chicago River (USACE 2012), as well as Maumee Bay, Lake Erie (Jerde et al. 2013). Impact of Introduction: Pflieger (1997) considered the impact of this species difficult to predict because of its place in the food web. In numbers, the silver carp has the potential to cause enormous damage to native species because it feeds on plankton required by larval fish and native mussels (Laird and Page 1996). This species would also be a potential competitor with adults of some native fishes, for instance, gizzard shad, that also rely on plankton for food (Pflieger 1997). A study by Sampson et al. (2009) found that Asian carp (silver and bighead carps) had dietary overlap with gizzard shad and bigmouth buffalo, but not much of one with paddlefish. Asian carps have been shown to affect zooplankton communities (Burke et al. 1986, Lu et al. 2002, Cooke et al 2009; Calkins et al. 2012; Freedman et al. 2012; Sass et al. 2014). Freedman et al. (2012) showed that resource use and trophic levels of the fish community change when Asian carps are present. They also demonstrated an impact on Bigmouth Buffalo and found isotopic values similar to Bluegill, Gizzard Shad, and Emerald Shiner. Irons et al. (2007) showed significant declines in body condition of Gizzard Shad and Bigmouth Buffalo following invasion by Silver and Bighead carps. They state that ultimately, declines in body condition may decrease fecundity. Remarks: Jenkins and Burkhead (1994) reported on the use of silver carp in a wastewater treatment pond in the upper James River drainage of Virginia. However, there is as yet no record of the species in Virginia open waters. 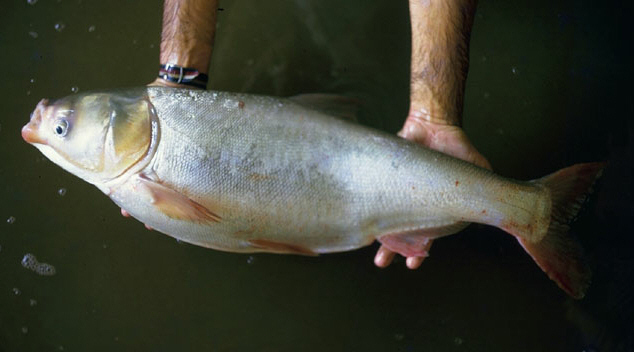 One of the so-called Chinese carps, the silver carp is a filter-feeder capable of taking large amounts of phytoplankton. Its diet also includes zooplankton, bacteria, and detritus (Leventer 1987). This species has been intensively cultured in many parts of the world, often raised in combination with other fishes. The report in Fuller et al. (1999) from Bay County, Florida was actually a bighead carp (UF 98162). Voucher specimens: Illinois (SIUC 17716, 23043, 23046, 24415; INHS 88425); Louisiana (NLU 65811, 66858, 66859). Baerwaldt, K., A. Benson, and K. Irons. 2013. State of the carp: Asian carp distribution in North America. USACE. 8 pp. Burke, J.S., D.R. Bayne, and H. Rea. 1986. Impact of silver and bighead carps on plankton communities of channel catfish ponds. Aquaculture 55:59-68. Calkins, H.A., S.J. Tripp, and J.E. Garvey. 2012. Linking silver carp habitat selection to flow and phytoplankton in the Mississippi River. Biological Invasions 14:949-958. http://link.springer.com/article/10.1007%2Fs10530-011-0128-2. Carp Task Force. 1989. Report to the Louisiana Legislature, March 1989. Three volumes. Louisiana Department of Wildlife and Fisheries, Baton Rouge, LA. 35 pp. Carter, F.A., and J.K. Beadles. 1983. Range extension of the silver carp, Hypophthalmichthys molitrix. Proceedings of the Arkansas Academy of Science 37:80. Chen, J. P. Xie, D. Zhang, Z. Ke and H. Yang. 2006. In situ studies on the bioaccumulation of microcystins in the phytoplanktivorous silver carp (Hypophthalmichthys molitrix) stocked in Lake Taihu with dense toxic Microcystis blooms. Aquaculture 261(3)1026-1038. Chick, J.H. and M.A. Pegg. 2001. Invasive carp in the Mississippi River Basin. Science. 292(5525):2250-2251. Conover, G., R. Simmonds, and M. Whalen. 2007. Management and control plan for bighead, black, grass, and silver carps in the United States. Asian Carp Working Group, Aquatic Nuisance Species Task Force, Washington, D.C.
Courtenay, W.R., Jr., D.A. Hensley, J.N. Taylor, and J.A. McCann. 1984. Distribution of exotic fishes in the continental United States. Pages 41-77 in W. R. Courtenay, Jr., and J. R. Stauffer, Jr., editors. Distribution, biology and management of exotic fishes. Johns Hopkins University Press, Baltimore, 430 pp. Courtenay, W.R., Jr., D.P. Jennings, and J.D. Williams. 1991. Appendix 2: exotic fishes. Pages 97-107 in Robins, C. R., R. M. Bailey, C. E. Bond, J. R. Brooker, E. A. Lachner, R. N. Lea, and W. B. Scott. Common and scientific names of fishes from the United States and Canada, 5th edition. American Fisheries Society Special Publication 20. American Fisheries Society, Bethesda, Maryland. Davidson, J.R., J.A. Brock, L.G. L. Young. 1992. Introduction of exotic species for aquaculture purposes. Page 83-101 in Rosenfield, A. and Mann, R. (eds.). Dispersal of Living Organisms into Aquatic Ecosystems, Maryland Sea Grant, College Park, Maryland, 471 pp. Domaizon, I., and J. Devaux. 1999. Experimental study of the impacts of silver carp on plankton communities of utrophic Villerest reservoir (France). Aquatic Ecology 33:193-204. Douglas, N.H., S.G. George, J.J. Hoover, K.J. Killgore, and W.T. Slack. 1996. Records of two Asian carps in the lower Mississippi Basin. Page 127 in Abstracts of the 76th Annual Meeting of the American Society of Ichthyologists and Herpetologists, University of New Orleans, New Orleans, LA. Erdman, D.S. 1984. Exotic fishes in Puerto Rico. Pages 162-176 in Courtenay, Jr., W. R. and J. R. Stauffer, Jr. (eds. ), Distribution, Biology, and Management of Exotic Fishes, The Johns Hopkins University Press, Baltimore, MD. Freedman, J.A., S.E. Butler, and D.H. Wahl. 2012. Impacts of Invasive Asian Carps on Native Food Webs. Final Project Report. Kaskaskia Biological Station, Illinois Natural History Survey, University of Illinois at Urbana-Champaign. 18pp. Freeze, M., and S. Henderson. 1982. Distribution and status of the bighead carp and silver carp in Arkansas. North American Journal of Fisheries Management 2(2):197-200. Hayer, C-A., J.J. Breeggemann, R.A. Klumb, B.D.S. Graeb, and K.N. Bertrand. 2014. Population characteristics of bighead and silver carp on the northwestern front of their North American invasion. Aquatic Invasions 9(3):289-303. http://dx.doi.org/10.3391/ai.2014.9.3.05. Henderson, S. 1978. An evaluation of the filter feeding fishes, silver and bighead carp, for water quality improvement. Pages 121-136 in R.O. Smitherman, W.L. Shelton, and J.H. Grover, editors. Culture of exotic fishes symposium proceedings. Fish Culture Section, American Fisheries Society, Auburn, AL. Hoff, M. 2004. Asian carp: huge fish with huge impacts. Aquatic Nuisance Species Digest 5(3)25-28. Indiana Dept. of Natural Resources. 2003. Indiana's Record Fish. Available at https://www.in.gov/dnr/fishwild/3588.htm. Accessed 6/27/2018. Iowa DNR. 2003. Non native fish species found in Iowa interior streams. http://www.iowadnr.com/news/03aug/nonnative.html. Iowa DNR. Irons, K.S., G.G. Sass, M.A. McClelland, and J.D. Stafford. 2007. Reduced condition factor of two native fish species coincident with invasion of non-native Asian carps in the Illinois River, U.S.A. Is this evidence for competition and reduced fitness? Journal of Fish Biology 71:258–273. Jerde, C.L., W.L. Chadderton, A.R. Mahon, M.A. Renshaw, J. Corush, M.L. Budny, S. Mysorekar, and D.M. Lodge. 2013. Detection of Asian carp DNA as part of a Great Lakes basin-wide surveillance program. Canadian Journal of Fisheries and Aquatic Sciences 70(4):522-526. Kolar, C.S., D.C. Chapman, W.R. Courtenay, C.M. Housel, J.D. Williams, and D.P. Jennings. 2005. Asian carps of the genus Hypophthalmichthys (Pisces, Cyprinidae) - A biological synopsis and environmental risk assessment. Report to US Fish and Wildlife Service per Interagency Agreement 94400-3-0128. Kolar, C.S., D.C. Chapman, W.R. Courtenay, C.M. Housel, J.D. Williams, and D.P. Jennings. 2007. Bigheaded carps: a biological synopsis and environmental risk assessment. American Fisheries Society, Special Publication 33, Bethesda, Maryland. Leventer, H. 1987. The contribution of silver carp Hypophthalmichthys molitrix to the biological control of reservoirs. Mikoroth Water Company, Israel. 106 pp. Li, S., and F. Fang. 1990. On the geographical distribution of the four kinds of pond-cultured carps in China. Acta Zoologica Sinica 36(3):244-250. Lieberman, D.M. 1996. Use of silver carp (Hypophthalmichthys molitrix) and bighead carp (Aristichthys nobilis) for algae control in a small pond: changes in water quality. Journal of Freshwater Ecology. 11:391–397. Lien, D. 2003. Asian carp pose formidable threat to Midwest waters. Knight Ridder Newspapers. November 26, 2003. Lu, M., P. Xie, H. Tang, Z. Shao, and L. Xie. 2002. Experimental study of trophic cascade effect of silver carp (Hypophthalmichthys molitrix) in a subtropical lake, Lake Donghu: on plankton community and underlying mechanisms of changes of crustacean community. Hydrobiologia 487(1):19-31. Middlemas, K. 1994. Local angler hooks a peculiarity. The News Herald, Panama City, Florida, 25 September 1994. Mississippi Museum of Natural Science. 2003. MMNS Nonindigenous Fish Records. Nebraska Game and Parks. 2000. The Fishes of Nebraska. http://www.ngpc.state.ne.us/fish/fishes.html. Pearson, W.D., and L.A. Krumholz. 1984. Distribution and status of Ohio River fishes. ORNL/sub/79-7831/1. Oak Ridge National Laboratory, Oak Ridge, Tennessee. Pennsylvania Sea Grant 2013. Pennsylvania's Field Guide to Aquatic Invasive Species. 185pp. Radke, R.J. and U. Kahl. 2002. Effects of a filter-feeding fish [silver carp, Hypophthalmichthys molitrix (Val.)] on phyto- and zooplankton in a mesotrophic reservoir: results from an enclosure experiment. Freshwater Biology 47(12)2337-2344. Rinne, J.N. 1995. The effects of introduced fishes on native fishes: Arizona, southwestern United States. Pages 149-159 in D. P. Philipp, J. M. Epifanio, J. E. Marsden, and J. E. Claussen, editors. Protection of Aquatic Biodiversity. Proceedings of the World Fisheries Congress, Theme 3. Science Publishers Inc., Lebanon, NH. Robison, H.W., and T.M. Buchanan. 1988. Fishes of Arkansas. University of Arkansas Press, Fayetteville, AK. Schramm, H.L., Jr. and M.C. Basler. 2004. Evaluation of capture methods and distribution of black carp in Mississippi. Mississippi State University. 12 pp. Spataru, P., and M. Gophen. 1985. Feeding behaviour of silver carp Hypophthalmichthys molitrix Val. and its impact on the food web in Lake Kinneret, Israel. Hydrobiologia 120(1)53-61. Starling, F.L.R.M. 1993. Control of eutrophication by silver carp (Hypophthalmichthys molitrix) in the tropical Paranoa Reservoir (Brasilia, Brazil): a mesocosm experiment. Hydrobiologia 257(3):143-152. US Army Corps of Engineers. 2012. Environmental DNA Calibration Study: Interim Technical Review Report. 27pp. US Army Corps of Engineers. 2014. Great Lakes and Mississippi River Interbasin Study (GLMRIS). Author: Nico, L.G., Fuller, P., and Li, J.